When tyrants are in the ascendant, it’s easy to despair. Tyranny holds all the cards of political and military power, and unarmed Love appears helpless against it; how can hugs possibly overpower handguns? And in addition to its physical arsenal, Tyranny has an even more powerful weapon inside the human mind: tribalism, the base urge of human beings to seek out those who are like them, and fear and distrust those who are not. The journey from “Love your friends, hate your enemies” to “Love your enemies” is not an easy one by any means. But those who have taken it make a surprising discovery: the entire universe suddenly allies itself with them, imbuing them with a power that Tyranny cannot hope to match. Here are five reasons why the words ascribed to Gandhi are true: Love will always win, and Tyranny will always fall. When Americans demonstrated for the rights of immigrants and refugees, parallel demonstrations arose from London to Tokyo. They arose not because the issue affected Londoners or Tokyoites in particular, but out of a basic sense of human solidarity, and the conviction that injustice anywhere is an affront to justice everywhere. The human capacity to extend love to anyone, to value the rights of others – even strangers on the far side of the globe – as much as your own, has helped freedom win decisive victories all over the world, from ending apartheid in South Africa to cracking open the closed state of Myanmar. Any attempt to wall it out is doomed to failure. Like the wind, Love can travel freely across oceans, over walls, through bars and fences…and, when it comes in force, blow you off your feet if you try to stand in its way. But of course, the biggest obstacle to this plan is that no one would willingly choose to live in a world like this. There are only two possible ways to make the people cooperate with such a system, and Orwell’s government depended on both. One is to govern through pain and fear, to torture and intimidate people into submission. This might be very effective in the short term, for as Nietzsche points out, “We make promises to love and decency, but we obey pain.” But we also do everything we can to avoid pain, and any government that tries to rule through pain and suffering will find all the wiles of human innovation working against it. And as any torturer knows, pain only works as long as the screws are being turned and the threat of worse to come hangs in the air. The moment it stops, so does cooperation. The other is to keep the people so drunk with rage and hate that they scarcely notice their own suffering. This also works for a while, because these emotions can be intoxicating, addictive liquors. But they are also poisonous, and people, at a visceral level, can tell the difference between poison and nourishing food. Hatred, rage, the gloat of triumph – why would anyone who has tasted love, joy, or real laughter choose to ingest any of those toxic substitutes? Tyranny can keep pouring these fiery liquors down people’s throats until they pass out. But then they will come to their senses and look back in horror at the consequences of their drunkenness. “War, torture, mass deportations, secret police, internment camps, gas chambers – how could we have allowed all this to happen? What on earth came over us?” Love, meanwhile, knew better than to let the stuff touch its lips in the first place. If Love and Tyranny saw a drowning child, then before Tyranny could say “How can we be sure that child won’t grow up to be an enemy?” Love would already be in the water. It is not in the nature of Tyranny to put itself at risk for anyone or anything. It draws people to its side by throwing around words like “security” and “freedom”, and using them to mean “I will protect you from others” and “I will not ask you to give anything for others.” Love is not interested in these promises; its nature is to give itself for others, without even pausing first to ask whether those others are in any sense “safe”. Since Tyranny is obsessed with protecting itself at all costs, it always overestimates the power of force and underestimates Love’s capacity for self-sacrifice. When the British met Gandhi’s march on the Dharasana salt works with violence, they naturally thought that once the blows started raining down, the demonstrators would either defend themselves or run away. Thus, they played right into Gandhi’s hands, never imagining that his disciples would be ready to risk serious harm, even death, just to show the world that their British overlords were not the enlightened, civilized gentlemen they claimed to be. When Tyranny tries to overcome Love with force, Love wins, because it is prepared to take risks and make sacrifices of which Tyranny is incapable. Tyranny may have all the guns, but Love has all the courage. Tyranny depends on keeping opposing voices silent, and silence is the most fragile thing in the world – you have only to call its name and it disappears. For Tyranny to ensure that its own voice was the only one the people heard was always difficult, and is all but impossible now. Even in the days when “media” meant only newspapers and radio, the Nazi propaganda machine was continually frustrated by underground presses serving fresh news from abroad to occupied populations starved for truth. Now, in the age of smart phones and social networks, any attempt to stifle the flow of information is futile. The best Tyranny can hope for is to sow confusion, dismissing its critics as “fake news” while spewing its own stream of “alternative facts”, in the hopes that eventually the people will no longer be able to distinguish truth from lies. Unfortunately for Tyranny, the people have a simple litmus test: the voices that Tyranny tries hardest to shout down are the ones most likely to be speaking the truth. Love has no need to fear the truth, and no hesitation about speaking it loud and clear. And when Tyranny is so desperate to suppress the truth that it wreaks its ultimate and kills the one who speaks it, Love makes sure that the martyr’s voice, far from being silenced, is amplified until it can be heard around the world. One final, indisputable truth is that without love, the human race would cease to exist. Without the love between man and woman, no children could be born. Without the love of family, they could not grow up. And without the love of friends, the world would scarcely be worth growing up in. Human beings can get along perfectly well without authoritarian rulers, but without love, they perish. 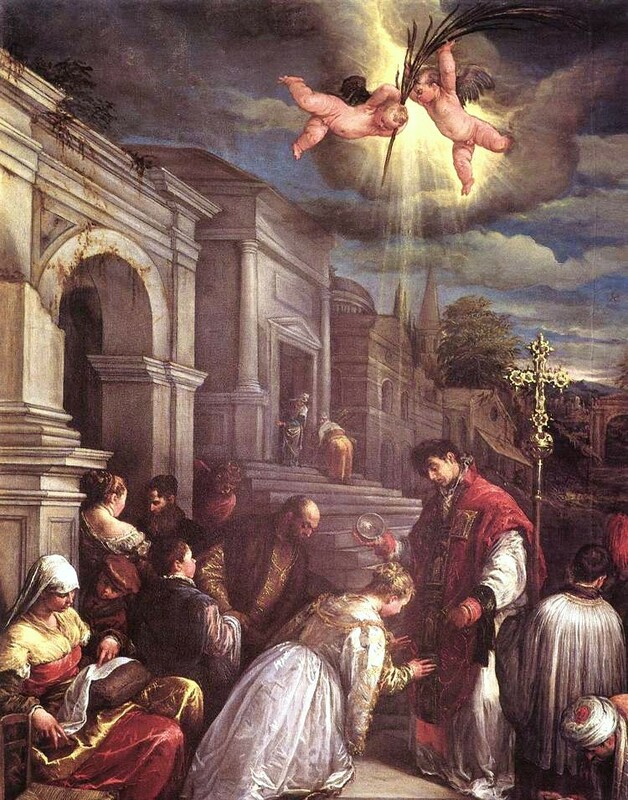 On Valentine’s Day, amid all the pink hearts and flowers and baby-faced Cupids, it is easy to forget that St. Valentine was executed as a dangerous political dissident. According to one story, the Roman emperor Claudius II (aka Claudius the Cruel) ordered Valentine beheaded for the subversive act of marrying young couples in defiance of executive orders. Frustrated at the trouble he was having in filling the ranks of the imperial army, due to a general preference among Roman youth for romantic conquests instead of the military kind, Claudius had called a halt to all weddings, in the belief that young men would be better fighters if they could be kept from being lovers. In other words, Tyranny makes an enemy of Life itself, of the force that creates it, and of everything that makes it worth living. The more Tyranny tries to subvert Love, the starker the people’s choices become: either die out, or else rise up and shake it off. When Tyranny and Love are in confrontation, the world and everything good in it allies itself with Love. Tyranny may well lament, like the devils in C.S. Lewis’ The Screwtape Letters: “Everything has to be twisted before it’s any use to us. We fight under cruel disadvantages. Nothing is naturally on our side.” Love finds friends where Tyranny sees nothing but enemies. Tyranny has to suppress or distort the truth; Love is happy to let the truth speak for itself. Love has all the creative power in the world on its side; Tyranny’s only power is to destroy, and it will ultimately destroy itself. And so Tyranny, as invincible as it may seem for a while, will always fall in the end.